The Topps Card Collector's Blog | A blog devoted to Baseball Basketball Football and Hockey cards made by the Topps Company. A blog devoted to Baseball Basketball Football and Hockey cards made by the Topps Company. In case anyone has actually been keeping up with this thing at all, I have decided to just stop for now. You see, the posts have been very inconsistent and I just havent felt like writing. The last post was from december! Anyway, the inspiration is pretty much gone. Im still buying selling and trading a bit of cards. So with what will be my final post for now, ill give a very brief summary of stuff. Ive had about 2 or 3 trades recently. I bought a 800 card lot of 1985 Baseball. Still not going to start actively pursuing it, but I will soon. I started an error card collection. The whole thing just sort of grew on me one day, you know, those unappreciated scrap cards. Yeah, wrong backs, different teams and all that. 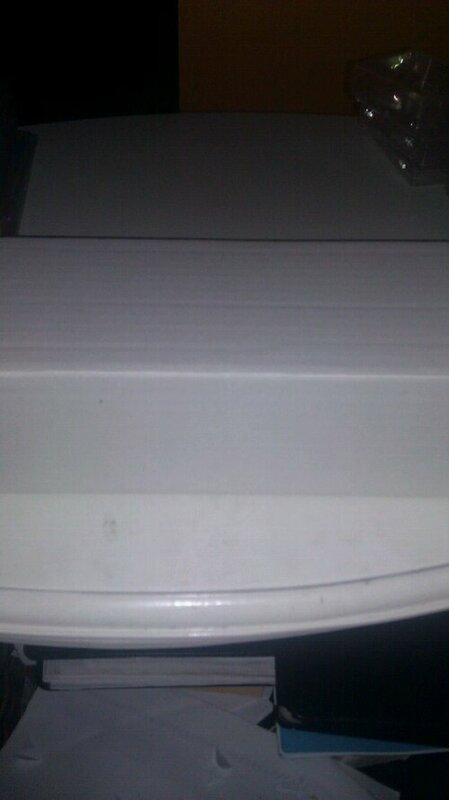 I got my first box bottoms not too long ago. Ive known about them for a while, but I thought, why not buy a few. So now I guess ill be adding them all to my collection. Collections, in the past 5 months ive decided to start 2 others. Funny thing is, theyre all base card related. Here they are. Sets: ive been doing this one pretty much forever, but now its more than just 1-660 or 792 or whatever, now its that plus box bottom plus any errors that are relevant like the 1988 Al Leiter or the 2007 Matsuzaka in japanese letters. Errors/variations/rare cards: ive got most of a list ready but im always finding new things and debating others. Right now its at about 2400, but I may add more. And to clarify, its base and the variation or whatever. And the last of my collections: Rookies. Thats a tough one. Its been a work in progress since february. I may just start the last 2 in 2015, once everything is sorted out. The player collections that I doubt will go far: Ozzie Newsome, Warren Moon, Roberto Clemente, and Yoenis Cespedes. Im still doing trades and stuff and ive been slowly moving every list to somewhere I can access it. With that I leave and say goodbye. It could be a month, a year or even 10. Who knows. Good bye to the blog (for now)…. Today, or somewhere around this week, marks 3 years since I first started this little thing. Ive wanted to do a post like this for some time now but the past 2 years the day has slipped by. 2011: I forgot and I was posting very rarely anyway. 2012: I was more active but by then my phone wasnt working and so I couldnt blog. I also didnt have a computer available at home so thats the reason. This year however is this post. So where are we after 3 years of writing? Not too far actually, in terms of collecting, there has been quite a boom in cards, trades, sales, stuff like that. I didnt have many cards when I started this thing. Maybe around 1800-2500. Now that has grown to over 7500. Not much of an increase to some but im not a big multi-box breaker so to me its a pretty big deal. Whats planned for the next year? I honestly dont know. More cards of course and there will be more TTM autographs to show. I still dont have a complete set to show off but im close, so very close. Im also hoping to add a few more printing plates (one or 2 at least) but thats the least of my worries in cards. I do hope to trade a lot more than now. I think I said that earlier in this post. Anything else to collect? Like I said way back in like January-March theres that Panini Prizm. I like it, but with only 2 years in production, I still doubt it lasts. I suppose I could start a set and if it doesnt last I can sell what I have. If I do decide on Prizm, this blog will need a new name. There will be some sort of contest, but a prize (if any) will take a while for me to find. So in closing, I have absolutely no idea what this post is about. I would like to close out by saying that ive had fun so far, but it could be much more better. Hello everyone, I know its been a while since I posted anything. I could write about how ive had nothing to write or ive been bored with the blog or anything else but thats not the case. I dont really have an explanation for you all so lets move on shall we? 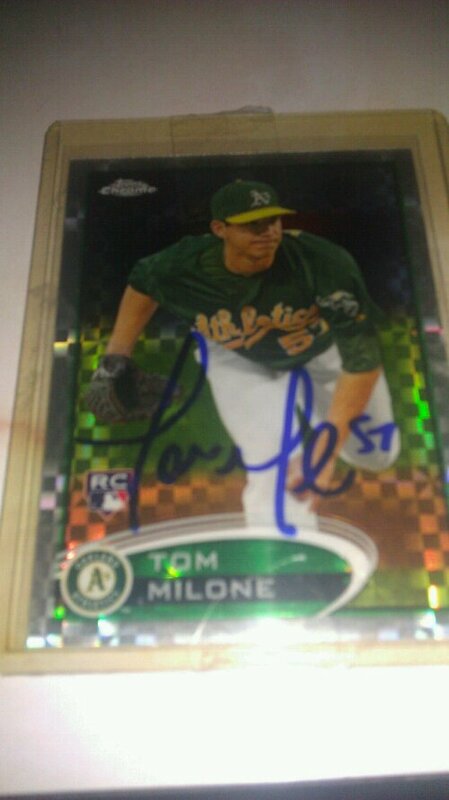 Thats a signed 2012 Topps chrome Xfractor. Thats not all I recieved though. I also sent him a 2012 chrome base and a 2012 Topps RC. That isnt the only ttm return ive gotten. 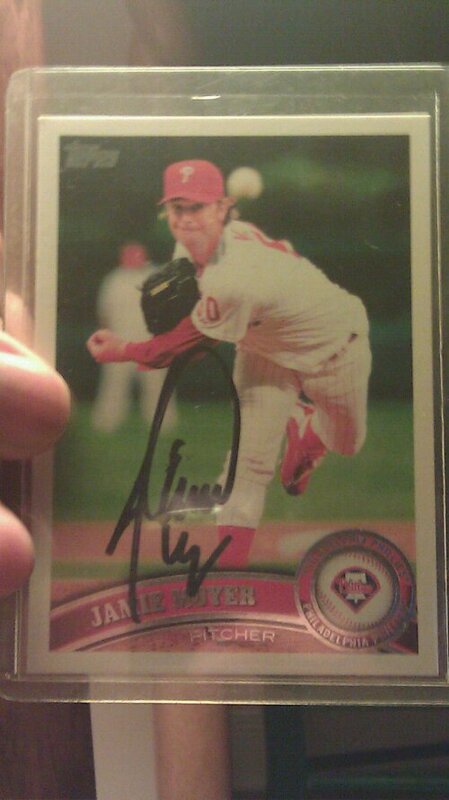 Things have been slow in that part of my collection, but ive also gotten a return from Nate Schierholtz and Joe Jacoby. On the non-ttm side of my collection I managed to get a complete set of 2011 Topps football. Now I have just the SPs and the factory exclusive cards. It may be a while before im actively posting again so just be patient. But dont worry, im thinking of a lot of things I want to write about. Hi everyone! You may be wondering why I havent posted anything since the end of june. Well its not that ive had nothing to post, I do but the thing is ive been waiting for a few cards to come in so that I can do a huge post. I suppose ill just break it off into pieces or something. 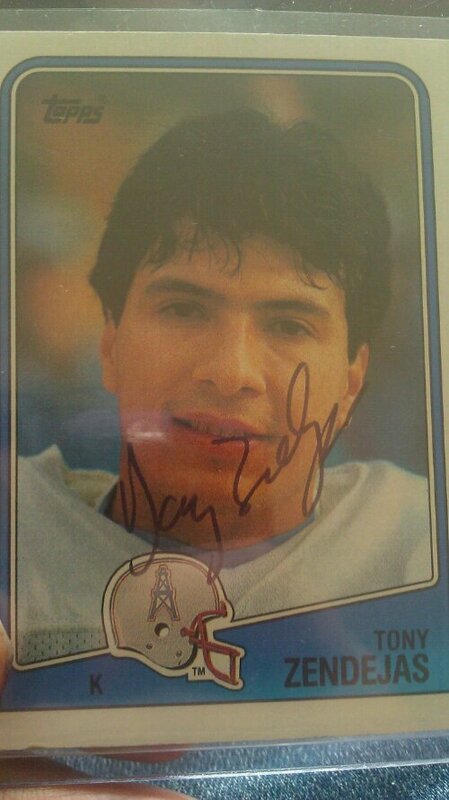 Anyway, the card you see at the top of the post is a signed Tony Zendejas card. 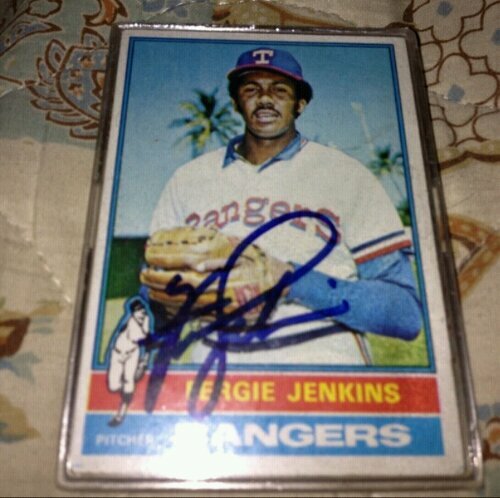 Im still doing the 1988 Topps auto set but im on and off with it. I never thought that zendejas did ttm but I saw a return and thought, why not? Looks like he signed it “dan” or “don” but its tony. This brings me to about 21 cards signed from the set. I got 2 of these signed along with a 1989 Topps and a 1989 team card of his as well. So in all 4 cards signed, but im keeping 3 for myself. On another note, I got 3 cards for my 1981-82 Topps set so ill post an update to that in a few days. Recently, I got a ttm return from Ray Childress. This wasnt any ordinary request though. 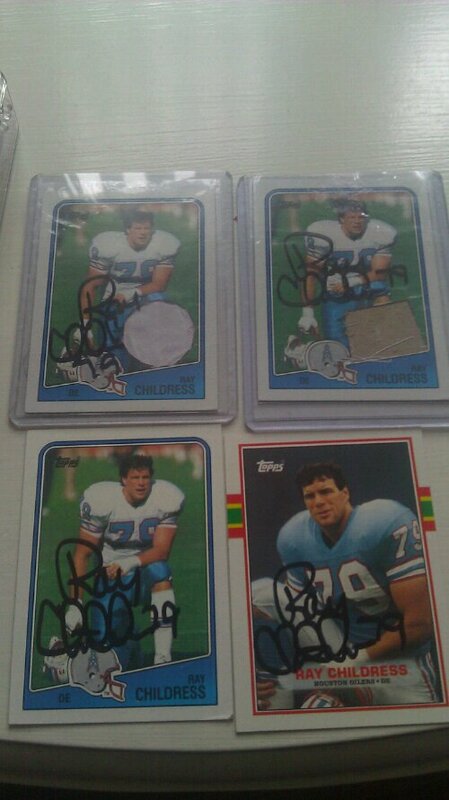 Im still doing the 1988 Topps football autograph set (slowly) but its still going. Anyway, I got that signed. The out of the ordinary thing was those custom relic cards. If youve been reading youll remember that a few weeks ago I got some custom relics made from a member on the blowout cards forum. I got those signed, however one was missing the relic piece. Oh well, cant really do much about it. I like it and ill have a few more made! 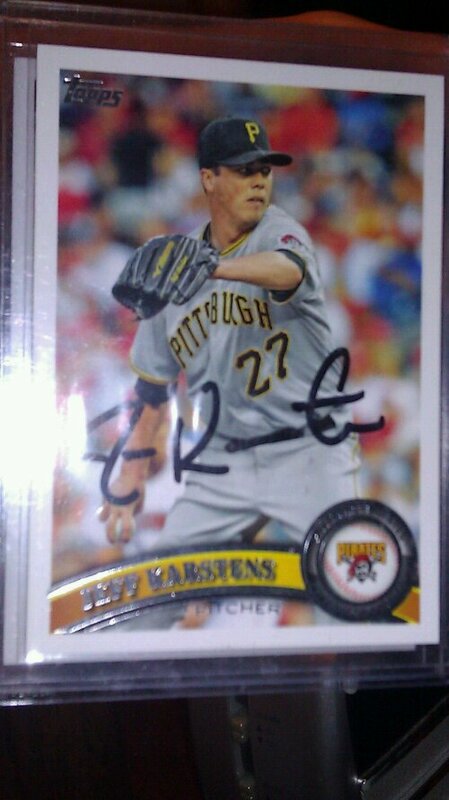 Jeff Karstens. I sent this one off in spring training. I sent this card along with another 2011 Topps and a 2013 Topps. All 3 were signed. Jerry Mumphrey. Along with this one I sent him 2 1981 Topps and a 1981 Topps Traded. I offered him a card and he kept it, one of the 1981 Topps. Eric Dickerson. One of my favorites so far. 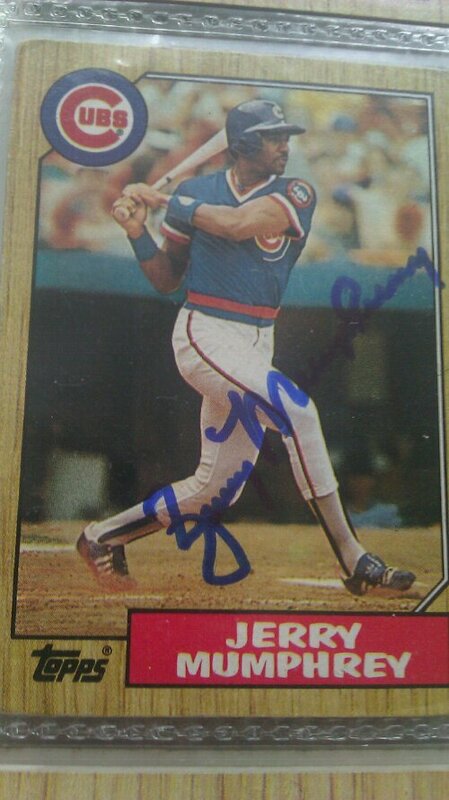 A great addition for my 1988 Topps autograph set im working on. 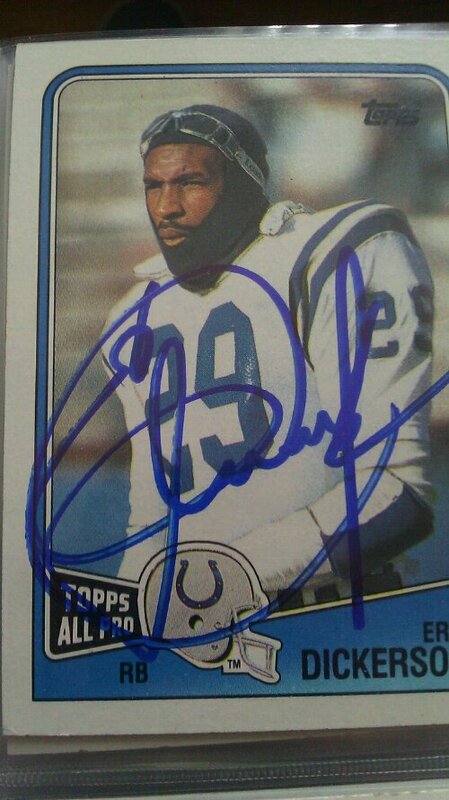 I wanted him to sign 2 of the 3 I sent but he kept a copy of this card along with the team card. Oh well, im still happy. Guess what this is. Ready?…. Yeah. 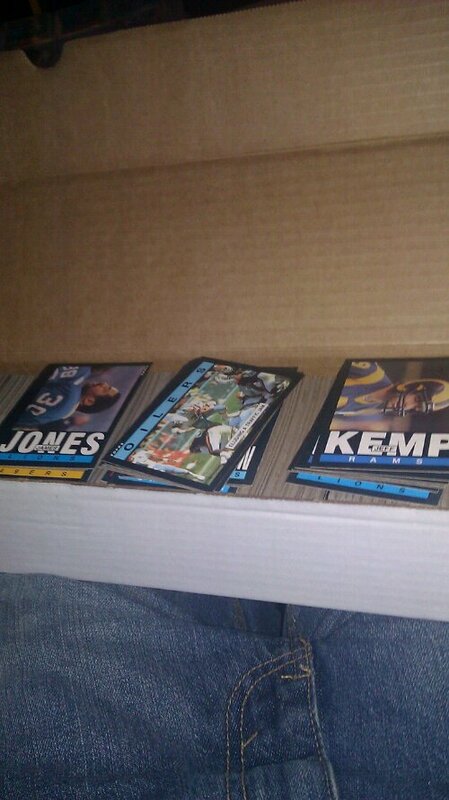 A lot of 800 1985 Topps football cards. With this I have most of my set finished and im down to the last 90 or so cards. I have a wantlist and a trade list ready but I need to post them. My first Game Used Card. And a topps tribute one at that. I got it from listia for less than 2000 credits. I thought it would have gone for a whole lot more but I guess not.